The full-screen mode allows you to work in a distraction-free environment. To start full-screen mode, open a text item, and either press the F11 key or click on the icon with two-arrows in the bottom-right: . To leave, you can either click on the right exit button on the top-panel (see below), or press the Esc or F11 key. If you move your mouse to the sides of the screen, you'll see panels appear that provide additional functionality. Right clicking on one of the panels will open a contextual menu. For the top, left and bottom panels, the contextual menu will allow you to configure the behaviour of the panel as well as its contents. The right panel's contextual menu allows you to scroll through the text. You can use the Alt-Left or Alt-PageUp hotkeys to navigate to the previous text and the Alt-Right or Alt-PageDown hotkeys to navigate to the next text. 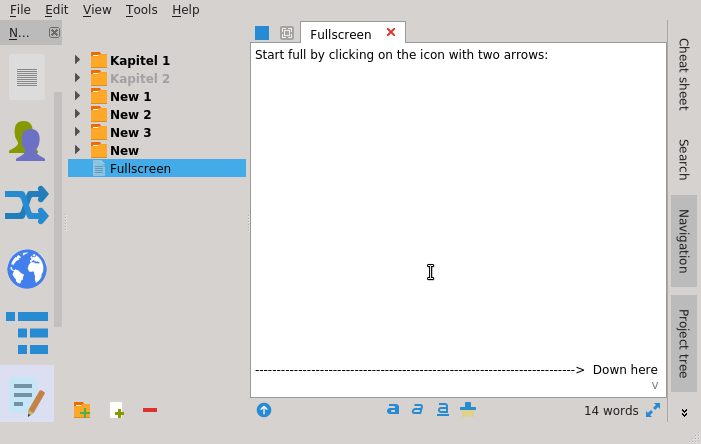 On the top panel, from left to right, you will find the Toggle Spell-check button, Navigation arrows, New Text button, Folder Path and Text Title, and the Exit Full-screen mode button. New Text: Show/Hide the New Text button which can be used to create a new text after the current one in the parent folder. Title: Show/Hide the text's Title in the center of the panel. 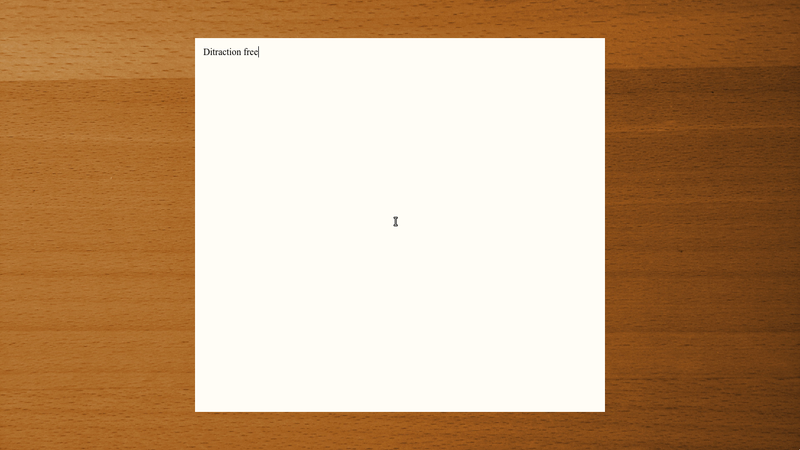 Title: Show Full Path: When enabled, the title will also include the full path of all parent folders in which the text resides. Note that clicking on the Title or on one of the folders in the path will pop up another contextual menu that lists all of the texts in the parent folder and allows you to quickly navigate to the text of your choice. If you select a folder, then the first available text in that folder will be displayed. If a folder is greyed out however, it means that it does not contain any text entries. On the right, the panel only contains the scroll bar. Right clicking on it brings up the standard and self-explanatory scrollbar contextual menu. On the bottom panel, a combobox to change the current theme, the text's word count and the progress bar (if you had set any goals for that text) and the clock. Progress: Auto Show/Hide**: Enables/Disables the automatic showing or hiding of the progress bar if you navigate to a text which has/doesn't have a goal set. On the left, in the middle of the screen, there is the screen locker. 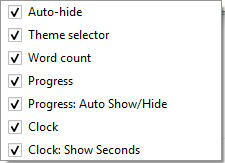 You reach a certain word count target (defaults to the remaining number of words to reach the goal, if set). A certain amount of time has passed. While locked, the button and escape key won't let you leave. Note: If you navigate to a different text while having a word count lock, the count target will change to match the number of words in the new text. 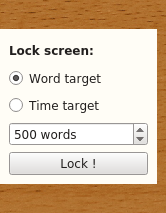 This can increase or decrease the target, and might remove the lock if you navigate to a text that exceeds the target amount of words. You can create new theme to make them look exactly the way you want. In manuskript's main window, go to Edit > Settings (or press F8), and go to the Fullscreen tab. Here you can Add theme, or Edit those you created. 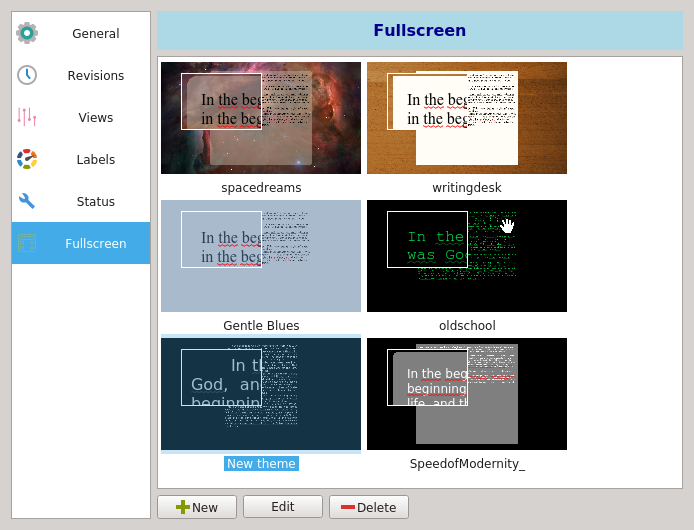 Manuskript uses the same theme format as focusWriter, you any theme for focusWriter could be imported in manuskript.